SA's three biggest cities are absorbing some of the tariff hike to pass on lower increases to beleaguered residents. A man was killed and 17 schoolchildren injured on Monday morning when a bakkie and a truck collided head-on near Imbali on France Main Road. 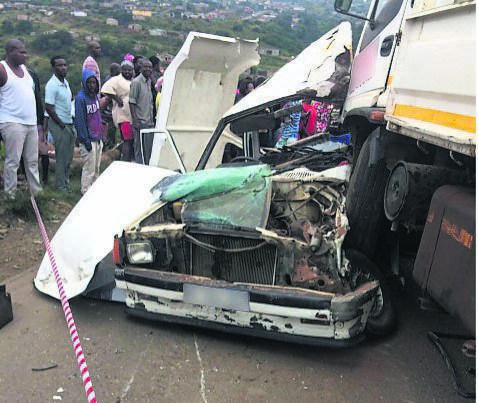 According to an eyewitness, the bakkie, which had been on the way to dropping off pupils in Imbali and Edendale, was driving along the main road when it was hit by the truck. “The truck had broken down on the road and the driver and other people were trying to start it,” and it rolled into oncoming traffic. “Unfortunately the driver failed to apply the brakes soon enough and crashed into the bakkie,” the eyewitness said. The truck driver had to be escorted from the scene by police after angry community members threatened to assault him. According to emergency services, children, aged between seven and 18, were found lying scattered around the scene. A 29-year-old man was found lying trapped in the passenger seat of the bakkie. The jaws of life and other rescue equipment had to be used to extricate the man. “Unfortunately, the man had already succumbed to his injuries,” said ER24 spokesperson Russel Meiring. Meiring said the children had minor to moderate injuries and were transported to various hospitals in the city for further care. While the Department of Transport (DoT) announced in 2016 that pupils may no longer be transported in the back of bakkies, Phendulani Ndlovu, KZN Scholar Transport Association regional secretary, said the department and provincial government had failed to provide omalume with the funding to buy cars so that they could comply with the regulations. Ndlovu said talks between the Transport Department and omalume had ground to a halt. “We were promised funding but recently the provincial Transport Department informed us that it didn’t have money,” he said. He said omalume could not afford the larger Quantum taxis. “Our government is not helping as they don’t come with a solid solution,” said Ndlovu, adding that they had hoped the government will assist them to acquire safer transport, such as Quantum taxis. The law amendment makes it illegal to transport school children for reward (paying a driver) in the goods compartment of any vehicle. The amendments were made to curb persistent crashes involving bakkies transporting children, which have claimed many lives.